Went to Silver Falls yesterday for a make-up/second chance hike. Actually, here’s what happened. 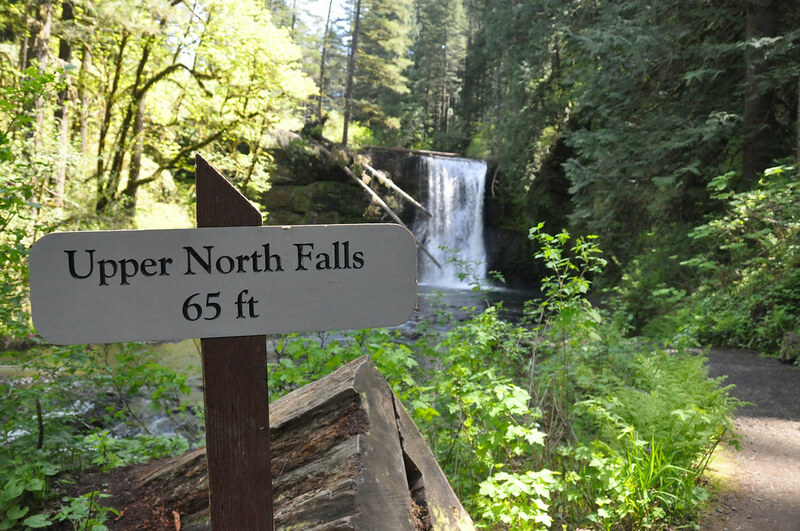 A woman in the meetup group was supposed to go with the group to Silver Falls on Saturday. She asked for a ride, and the guy who agreed to pick her up was quite late. So when the two of them got to the State Park, the group was already out on the trail. She called me that afternoon sounding pretty upset at the whole situation. I felt bad for her, but what could I do about it? I suggested that, as she doesn’t work during the week, we could take a trip to the falls on Wednesday. She seemed to think that was a swell idea, so I began arranging a group to go to the falls during the week. At one point, I had 4 people planning to come with me for the hike. Well, in the end, the aforementioned girl ended up not wanting/being able to come (why did I go to all this trouble anyway??) and another friend dropped out. Three of us ended up driving to the park but one woman anticipated that she wouldn’t be feeling too well and didn’t plan on staying long. That left 2 of us to make the hike. Our plan/goal: hike the Trail of Ten Falls. As the two of us remaining had already seen the South Falls, we decided to walk the loop in an anti-clockwise direction. We passed by Winter Falls and arrived at North Falls (at 3 on the map below) with no problem. But thereafter, we ended up going completely in the wrong direction. We didn’t notice any trail other than one marked Perimeter Trail, so that’s the one we took. Rather than loop us back around to the north and west, we traveled south and east (as can be seen in the map). So, we didn’t get to see many waterfalls, but it was a pleasant hike. A touch warm for my taste, but mostly under canopy. This just means we’ll have to give it another try. I’m a member of several Meetup groups. These groups have been very helpful in my first few months here in that they’ve greatly facilitated the meeting of new people. I’ve gone on numerous hikes, some dinner outings, several coffee meetups, dancing, photography, book clubs… I’ve met some great people. But there has also been drama. One group I’m in is based out of the college town 30 minutes south of where I live. It was initially set up as a summer outdoor activity group. Let me bore you with some history. The group came to be in May. The organizer (whom I’ve never met) scheduled a few meetups to discuss what kinds of things the group ought to be doing. It seems like this founder only paid for a month’s worth of service to the Meetup.com website and then elected not to renew at the end of that month. At the beginning of July, one gentleman in the group, let’s call him Ecurb, was thinking about stepping up (and paying the subscription fee) to become the new organizer, but he decided to sleep on it. By the next morning, another member, Abby, had already paid the fee and become the group’s leader/organizer. Ecurb contacted Abby and let her know that he’d been considering the role and offered his help. Abby made Ecurb a co-organizer. A couple of activities were planned for July and August, and I joined the group for a hike in September. This hike was only the fourth activity for the group since its reboot. Starting in October, the group got much more active, at least in terms of how often meetups were scheduled. Ecurb was doing most of the scheduling, but Abby had organized a bike ride for Oct. 9. I was attending all the meetups and Ecurb asked if I’d be interested in being a co-organizer too. Sure, I said. Make it happen. Abby didn’t make it to the bike ride she’d scheduled, but did alert us ahead of time. By the end of October, it had been nearly two months since I’d seen or heard from Abby. I did hear that life had gotten pretty busy for her, and that’s fine. What I did want was a bit of discussion amongst the organizers as to what the group would be doing as we moved forward. Anyway, towards the end of October, Abby did schedule two or three more meetups so we knew she was alive. Following a hike at the end of October, 8 of us went to lunch at a local Mexican restaurant. They were apparently short-handed that day and the service reflected that. I am always very chill when in that kind of situation. First of all, I understand that for the most part, they are doing the best they can. Certainly my getting upset won’t help the situation. Second, if I feel that this is what I can typically expect from the place, I just won’t go there again. I realize not everyone reacts the same way. Ecurb in particular was quite vocal about his displeasure with the service. I was really uncomfortable with how he dealt with the situation. Despite the fact that we’d been going out to eat after every hike for the past two months, I decided that I would not be eating out with Ecurb again. Ecurb is quite a bit more eco/hippy than me. Nothing wrong with that, just different. Whereas I react to the fact that the seasons are changing and the weather is likely to be MUCH more rainy for the next several months by looking to plan indoor activities for the group, Ecurb feels that getting drenched is just part of Oregon living and we should embrace it. He even responds to a discussion about what to do during the winter by scheduling a hike and calling it, “The question asks, ‘What should we do?’. I reply, ‘Enjoy planet Earth'” instead of “McDonald Forest Hike”. Not at all descriptive of the hike itself. But whatever, that’s just Ecurb being Ecurb. Not a huge deal. So a week ago, I get a message from Meetup that Abby has stepped down as organizer and someone else needs to pay for more subscription time or the group will be closed. (Ecurb did end up paying for more time and thus became the organizer.) I emailed Abby to ask what was up and she replied that she’d received a nasty-ish email from Ecurb chastising her for not living up to his idea of leadership. Her response was along the lines of, “If he wants to be in charge, fine, he can be in charge.” A day later she quit the group entirely. While I think that her rage quitting was an overreaction, I blame Ecurb for stirring up all this mess for no reason and for no gain. There was NOTHING that he or I couldn’t do as co-organizers that he can now do as the primary organizer. He’s emailed me a couple of times since this incident to criticize Abby and to explain some of his thoughts on leadership. But I’ll say it again, we’ve gained not a single thing as a result of stirring up this shiz, and not only have we lost Abby as a member, but one of her friends has departed as well. There may be more to come. Gaahhh! So idiotic to have initiated this drama. Well done, Ecurb. I haven’t really gone into this much detail about how I feel about the situation with Ecurb. You may ask why not. Well, two reasons. One, much like my attitude about poor customer service, I’m not one to inflict my opinions on others as to how I feel about their behavior. People can do whatever they want, and I can react however I want. My reaction is to distance myself from those people. Second, I haven’t seen Ecurb in person since this all ‘sploded. It’s entirely possible that he will be reading this post. I’ve changed the names to protect the innocent and the guilty, but anyone halfway aware of the people involved will recognize the players with no difficulty. I’m at least 50% tempted to drop this group myself. I don’t need the drama. But before I go that far, I’ll try some distance for a while. Who knows, my lack of 100% participation may motivate Ecurb to send me a nasty email complaining about my leadership. After having been up since just after midnight (and that was following about 2.5 hours of sleep), I finally went to sleep last night around 11:30. I slept until 9:30 this morning and let me tell you, that felt good. Today I felt a bit better. Part of that was due to all the running around I got myself into. Being busy is a good distraction from feeling sorry for myself. The other reason that I’m feeling better today is that I got my computer set up and connected to the internet. A small measure of comfort and familiarity has been restored. I am now in Salem. This last weekend in Modesto was particularly difficult. I finished clearing out my apartment and loaded as much as possible into a trailer. The rest I threw away. The emptiness of the place was just really stark. I got a special gift from Real B. I wish we’d reconnected as adults under slightly different circumstances. I went to Jeff’s wedding and spent a few moments with some friends that I haven’t been close to in a while. It was lovely to see and talk to them, but it all just reminded me of what I have lost. I know that the coming weeks & months will be filled with new discoveries & new people, but I miss what I do not have. So now I am in my aunt’s house, surrounded by things that aren’t mine. I went to set up my computer this evening only to discover that it seems to have been damaged during transport. So I do not even have that means by which I can keep connected to things that are familiar. I feel alone and sad and disconnected. I want to be in my own place and to be working again.